I probably don’t need to tell you that Vasse Felix lay claim to the first commercial vineyard planting in Margaret River – that being in 1967. For a wine region of such youth, Margaret River is already held in high esteem, and it’s no wonder the Euros shake their heads dismissively that an upstart young region can take it up to them in the quality stakes, especially with Cabernet and Chardonnay. I can’t be sure who made the 2006 Vasse Felix wines – I think Clive Otto had left at this point and Dave Dowden was caretaker winemaker. I think. The Heytesbury red and white are the icons of the Vasse Felix line-up and I’m sure no expense is spared in turning them out. The 2006 Heytesbury Chardonnay has a lovely deep straw colour. It opens with textbook Margaret River cashew and fig, melon and pear, plus a little sweet lemon. Peachy keen. It’s on the minerally side with no obvious signs of fattening through malo or any extended oak usage. The oak is there, of course, and looks stylish and new, but it doesn’t get in the way of the alluring fruit aromas. I get orange blossom and frangipani scents, a hint of marzipan, some yeasty characters, and my all-time favourite tinned peach and custard combo. There’s a slight regional character which I often see in Margaret River wines – I call it ‘maritime’. It’s hard to describe (terroir?) but it’s a slightly salty/beachy/sea-like aroma, and whilst I don’t go looking for it, it often pops up in my notes. The minerality continues on the palate and is neatly entwined with the lemony sweetness, pear and white peach flavours. It’s generous enough, though certainly no fruit explosion in your mouth. The texture is finely balanced between cream and crisp – in fact there is still a bit of acid zip that dances over your tongue with an airy lightness, adding to the freshness and youthful feel of the wine. The oak envelops all – not overdone or in the way, and not as a backbone – it simply surrounds all the flavours and wraps them up gently as a piece of cupped lettuce does for san choi bao. If pushed to find something critical here I’ll make the small observation that the wine finishes a touch short. There’s an overarching theme of restraint with this wine. A certain reserve. You can almost see the wine trying to bust out of a straitjacket, bursting forth, frothing over and spilling down the sides of the glass. But I do like wines with restraint. (Margaret River Cabernet can be good like this too). This is not a heavy wine, nor has the winemaking been heavy-handed. It ably combines generosity with restraint and should please all who would sail her. 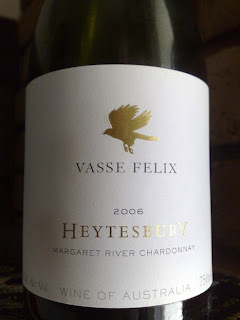 Producer: Vasse Felix – www.vassefelix.com.au – established 1967, now owned by the Holmes a Court family. Region: The oft-revered Willyabrup sub-region is where the winery and estate vineyards are located, in the central north section of the Margaret River wine region. There’s no indication where the actual fruit comes from for this wine. Vintage: 2006 was a tricky year in the region, split along white/red lines basically. A cooler year generally with whites routinely outstanding – leaner and more minerally than usual, but refined and potentially long-lived. Reds were mixed – those growers with ripeness and good sugars who picked before the Autumn rains were rewarded. Those in cooler sub-regions who didn’t/couldn’t pick were punished.